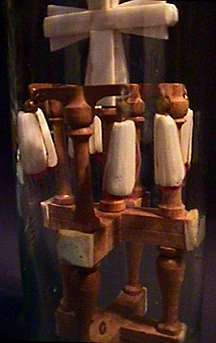 This bottle contains a tower built of crossed pieces supported by turned posts in two levels. The top posts have additional cross pieces on top with ivory carved tassles hanging from them. On top of everything is an ivory Maltese cross. There are four known bottles of this design. They appear to be identical in every way except for the cork. The closeup picture below is from the second of these bottles. They are so much alike that it makes no sense to show both separately on this website.